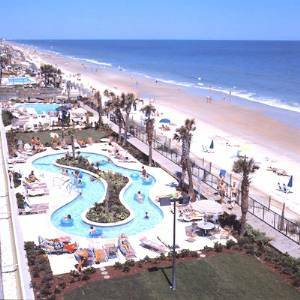 The spectacular Compass Cove Resort is located near the center of Myrtle Beach and is one of the area’s largest resorts. 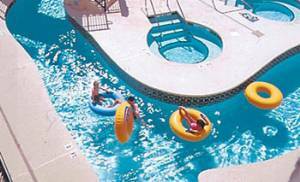 It offers a stunning array of guest pleasing amenities including 21 pool features! 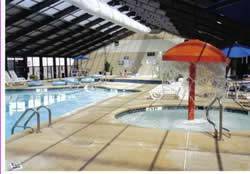 There are 6 indoor and outdoor pools, 3 indoor and outdoor Lazy Rivers, a number of hot tubs/Jacuzzis, and kiddie pools to please the younger ones. There is also a free indoor water park on-site for year round fun no matter what the weather or temperature. Our new condo is located on the 3rd floor of the Pinnacle Tower which is a direct oceanfront unit with a beautiful view of the Atlantic Ocean. 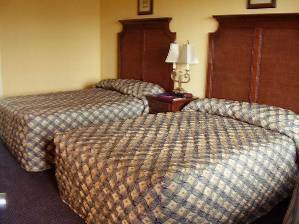 The bedroom features 2 full size beds and the living room has a sleeper sofa and a wall bed. It sleeps a maximum of 6 people. 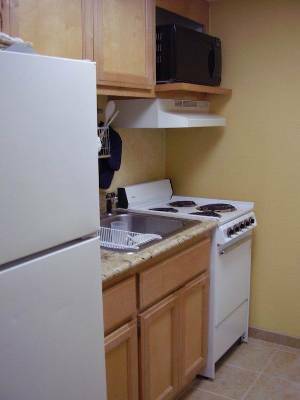 There is a full bath and a kitchen complete with cooking utensils, refrigerator, stove, microwave, and coffee maker. The sliding glass door in the living room opens to your private oceanfront balcony. In addition to 21 water amenities, the Compass Cove Resort has the award winning Compass Rose Restaurant onsite. There is beach volleyball, oceanfront shuffleboard, exercise room, oceanfront bar & grill, Tiki Bar, video game room, and men’s and women’s sauna. The list of resort activities is endless! 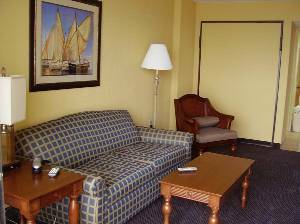 The Compass Cove Resort is located at 2311 South Ocean Blvd. in Myrtle Beach. 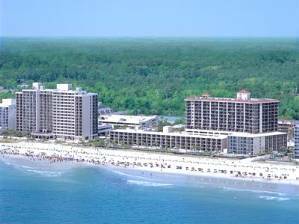 The Myrtle Beach area has more than 200 sunny days a year and a temperate year-round climate. It is a paradise for beach goers offering endless hours of swimming, surfing, sailing, fishing and other beach activities. Myrtle Beach is the Golf Capital of the World with over 100 area championship courses. There are nearly 1700 restaurants and eateries to make your mouth water. The nightlife in Myrtle Beach includes popular nightclubs and eleven live-entertainment theaters ranging from country music concerts to Broadway at the Beach. Whether you want to spend your vacation relaxing or doing a variety of outdoor activities, Myrtle Beach is the place to be! The resort pools are right by the beach! Kitchen is furnished so you can cook your own meals! Relax in the indoor lazy rivers and jacuzzis. There is year round water fun no matter what the temperature! 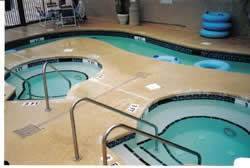 There are 21 pool features at the Compass Cove Resort! Saturday to Saturday only during summer. Holiday rates may be higher. Add 11% tax. Refundable $200 security deposit. No pets and no smoking. The primary renter must be at least 25 years of age.